Last week we at Kotaku East showed you how to play Valkyria Chronicles 3, even if you don't understand Japanese, using a collection of translations and guides from across the internet. Of course, for the more patient of you—or just those who want everything translated and in one simple package—there is another option, if you're willing to wait for it. The Valkyria Chronicles 3 Translation Project is a group of fans working hard to—as the name implies—translate the game into English. But the scope of the project is far more than simply translating the game. They plan to go into the game's code and insert the translated script and menus just like in a professional localization. Since the project started back in February of this year, the project has shown great progress. Not only have they translated the majority of the script (with only the side and post-game missions still left to go), but they have also already inserted the main story translation into the game proper. There is still a lot of work to do, however. There are bound to be more than a few formatting errors in the text; and the only way to check for them is to play through the entire hundred-plus hour game, looking for errors manually. They are also experiencing issues with the menus' character limits (as Japanese often takes far fewer letters than English). And on top of that, there's the translation of the remaining missions to finish. When completed, their translation patched version of the game will be playable on PSPs with custom firmware installed. They also plan to release the patch for both the original Valkyria Chronicles 3 and Valkyria Chronicles 3: Extra Edition. 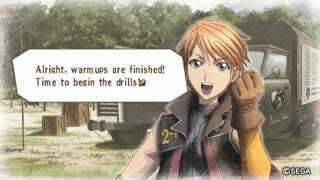 The Valkyria Chronicles 3 Translation Project has yet to announce an expected release date, but they seem to be going strong and continue to give updates on their progress at least once a month. Stay tuned to Kotaku East for further updates as this project nears completion.